On my drive back home from Cologne on Monday night I was replaying the evening in my mind, already trying to figure out how I would best write about it, determined to follow through with actually writing this post on Tuesday. I had felt a head cold coming on all Monday though, which started to hit me full force on Tuesday. I still went to work and somehow got through the day, coughing and sneezing, being met with “Stay the hell away from me” gestures in a few offices ;-). Wednesday I threw in the towel and went to my GP who put me on sick leave for the rest of the week and send me home. Where I spent the last four days alternatively in bed or on my couch. Sneezing, sniffling, coughing. Feeling better, feeling worse. Whining! I’m a pathetic patient sometimes. Anyway: The bestselling author Jojo Moyes was in Cologne on Monday! If you know me in real life or on Twitter or just from this blog you might know that in the last 15 months or so I’ve turned into a huge fan of her work. I read 11 of her novels (which is almost her complete work) in less than a year. Plus, of course, her latest one “After You” right as it came out a few weeks ago. This week I’ve finally also put the novella “Honeymoon in Paris” and the Quick Reads “Paris for One” on my Kindle to fill in the last blanks. So, yeah, big Jojo fan over here. I could list all the reasons why again, but I’m lazy and just point you to this post from the end of 2014 where I already sung her praise in an all around way. Or if you want to read it a bit more specifically, check out the other few posts (listed not in chronological order though) I wrote about her novels and such. About 3 weeks ago I found out by chance that she’d be at an event at the Book Festival “Lit.Cologne” in Cologne on Monday, 12. October 2015. LitCologne events with bestselling writers usually sell out quickly, but this one took place for in a large – for a book event – venue with about 600 seats, so I was able to still get a ticket. Lucky me! I’ve read some interviews with Jojo and seen some interview clips online over the last year, but seeing / hearing someone in person is still another experience and I was very much looking forward to that. Because the work and interviews of any artist you love and admire – whether they are writers or actors or singers – usually give you an idea of the person behind the art. And as a fan, you naturally want the real person to “live up” to the positive idea you conjure up of that somebody in your mind. I mean, you’re a fan after all, aren’t you? In Jojo’s case my idea – formed by her books, a couple of interviews and her tweets and such – was, that she is a funny, witty, down-to-earth, all around lovely person. But seriously, I had a great time! I only managed to get a seat on the upper tier (I was kind of late to buy a ticket after all), but I saw the stage just fine and the evening wasn’t so much about watching the stage, but listening to what was read and said. The event was basically an interview with Jojo, interspersed with a german actress reading a chapter or a section from the German edition of “After You” but also Jojo reading some parts herself in English. I’ve always read the original English edition, as I prefer to do with novels these days and because I’ve by now read some underwhelming translations of novels. So this was the first time I heard Jojo’s words in German and I have to say, the translator Karolina Fell has done a great job. To me the story definitely hasn’t lost anything in translation. The interviewer was the wellknown German journalist / writer Margarete von Schwarzkopf and she asked some really good questions. She also translated Jojo’s answers really well and accurately, which I thought was quite impressive. Sloppy translations in a live interview are a pet peeve of mine. Yes, I know, for a non-native English speaker, I’m quite the language Nazi sometimes. I can’t help it. Like I said, there were good questions and more importantly, entertaining, funny, but also interesting and reflective answers from Jojo. A few things I knew from other recent interviews, but there also was some new (to me) information and most importantly the overall impression that she is indeed a genuinely likable person. Biggest and best news first: Jojo is working on the film script for “The One Plus One”. Wooohooo! Such great news, because it’s my favourite of her novels and I always thought it would make a great movie. I can’t wait to read more about it and hope that it will definitely make it out of the planning stages and into production. Pretty early on while talking about “Me Before You” Jojo used the German title “Ein ganzes halbes Jahr” which prompted an extra round of applause from the audience. She openly shared some tidbits from her past, because of course she too has lost loved ones before, so she knows how that feels and what it takes to get through it, but also that everyone processes grief differently. She talked about family and family dynamics, especially among siblings, which is something I could very well relate too. Jojo herself is an only child, but as a young adult, she got two half-sisters and was fascinated by the love/hate relationship between these siblings, because she hadn’t experienced that herself before. I’m the youngest of four (3 boys and me) and even though we of course got into fights as kids and even though we still might have some issues with each other as adults, I know they will always have my back. Just like Lou in the novel Jojo had worked as barmaid for a while at some point in her life and had heard all the stories. She also stated that she seems to have a face that makes people just tend to tell her very personal things very quickly. She would never use any of those as material for a novel though, but she did share a funny story about after a 10 minutes drive to her home, a taxi driver didn’t stop talking and telling her his story for another 20 minutes. In front of her own door. There are two teenager in “After You”, both of them very well written, the interviewer and I agreed on that. Jojo has two teenagers at home and of course that helped with making the teenagers in the book feel like real teeangers in the way they talk and the way they act. I absolutely agree with Jojo’s assertion that it can be difficult to be a teenager these days, more so than it was for us 25 – 30 years ago. And that we should never forgot that even though teenagers might seem to act all grown up or are even expected to, that they are still so very vulnerable. To me Lily in “After You” is a perfect example of that and Jojo did a great job portraying this limbo teenage girls (and boys) go through. She consciously did not let Lily and Jake speak any current “teenage speak”, because it changes so fast and would be out-dated in a few years and the novel should of course be kind of time-less. When talking about sequels and why she usually doesn’t write them, she mentioned that she also usually doesn’t let characters from one novel appear in another. With one exception, which probably only the very dedicated readers might have noticed. I perked up at that, because I did consider myself a dedicated reader. So, the woman who has to leave the ship early on in “Ship of Brides” reappears in “Silver Bay” where she gets her Happy Ending. Woah! Dedication or not, I admit I did not notice that! Possibly because I might have read those two novels out of chronological order. Or maybe I’m just not the most diligent reader sometimes? Anyway, very interesting tidbit and a good excuse to re-read “Ship of Brides” one day, which is one of my favourites of her work. Of course Jojo was ready to sign books afterwards, so once I got back down from the tier I joined the already long line. I was determined to at least tell her how much I loved the tidbit about Ship of Brides / Silver Bay and that I indeed did not notice that the character appears in both stories. I could now quote my words about how I usually don’t post photos of myself online from the Bumping Into Frank Turner post from March. But once again, if you’ve made it till the end of this post, you deserve to see what I was going on about. Messy hair or not. I’m grinning like a Cheshire Cat, aren’t I? I can’t help it. I was happy and excited…. Excited or not, I was luckily not so nervous to get completely tongue-tied though. 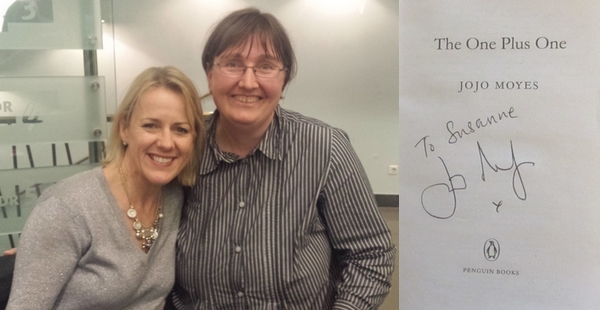 Because while Jojo was signing my book afterwards, I did indeed not just thank her for the lovely evening, but also told her how much I loved to hear the bit about Ship of Brides/Silver Bay. She said something like “So, now you have to pull them out and read again ;-)” to which I only replied that I definitely will. She once more thanked me for coming and then I cleared the way for the next reader in the still pretty long line.